Other Notes: Three-dimensional, projection-style metal AED wall sign to identify the location of your AED. Metal AED Wall Sign "V" Shape. This durable, painted metal projection-style sign is great anywhere. The 3-D shape is visible from any direction. 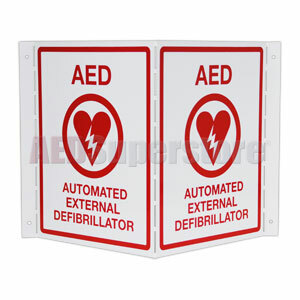 Place this sign above your AED cabinet or wall mount bracket and show customers and employees you have an AED on site. Red on white. 20 gauge steel (1mm thick). 10" high x 8" wide per side x 6" deep. Weight is 1.76 lbs.